Dwayne Haskins led the No. 6 Ohio State Buckeyes to a 45-24 win over No. 21 Northwestern to win the Big Ten Championship. Facing a statistically-solid Wildcat defense, Haskins set a Big Ten Championship Game and OSU single-game record with 499 yards passing. He completed 34-of-41 passes, and threw for five touchdowns on the night. The passing total broke Haskins’ own OSU single-game record, which had stood at 470 in the loss at Purdue. He also broke the Big Ten’s single-season record for total offense (4,702), surpassing Michigan’s Denard Robinson (4,272) early in the game. Haskins already holds the conference records for passing yards (4,580) and passing touchdowns (47) in a season. After the game, he was quick to spread the credit around. His head coach was much more effusive in his praise for Haskins’ performance. He told reporters that the quarterback had definitely earned one of the finalist spots for the Heisman Trophy. “He’s without question a Heisman candidate. I’ve seen the statistics of the other two great players, and there’s no doubt. 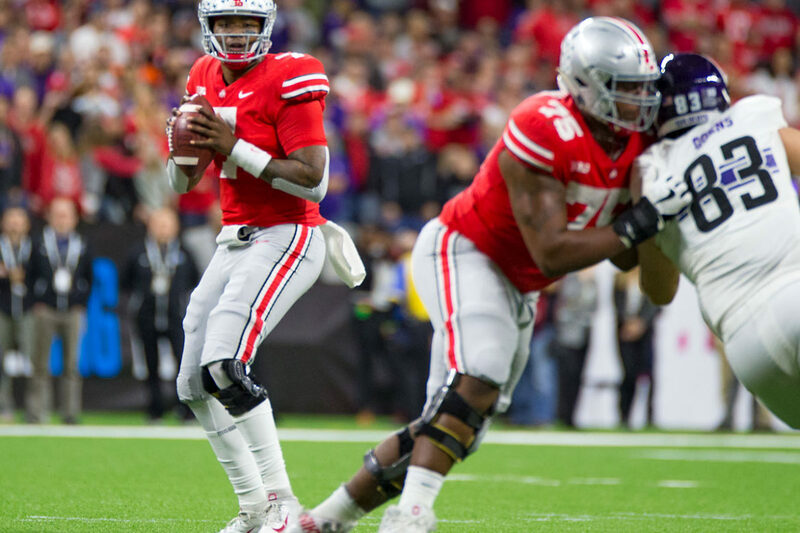 Dwayne Haskins is a Heisman candidate, and he should be in New York City,” Urban Meyer said. Haskins’ statistics are absolutely mind-boggling. He has completely rewritten the OSU single-game and single-season passing record book, and is now working on the Big Ten’s records as well. 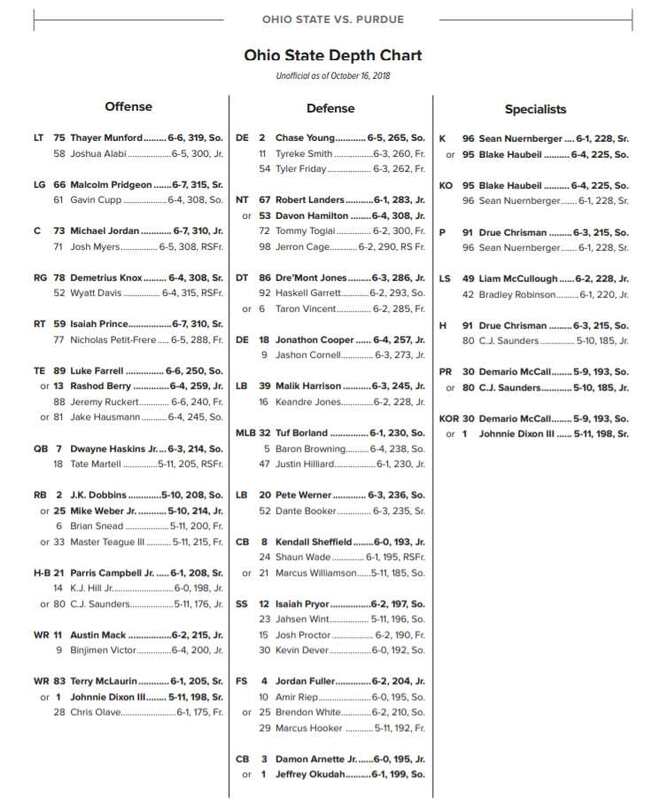 Haskins: 499 vs. Purdue. His owns the 1st, 2nd, and 4th, and 5th-most yards ever thrown for in a single game. Haskins: 4,580 through 13 games. Haskins: 5,145 so far. He is currently in 10th place all-time, between Braxton Miller and Jim Karsatos. Haskins: 496 so far. He beat Germaine’s record (384) late in the 4th quarter against MSU. Haskins: 553. Unless you think he’s going to play until he’s a fifth-year senior, this one is probably safe. Jim Karsatos is in 10th place with 629. Haskins: 348 so far. He broke Barrett’s 2017 record (240) late in the win over Nebraska. Haskins: 388. He passed Jim Karsatos, Mike Tomczak, and Steve Bellisari to move into 8th place all-time..
Haskins: 87.5% vs. Tulane (21-for-24), 3rd all-time. 86.9% vs. Rutgers (20-for-23), 4th all-time. He had two of the four most accurate passing performances in OSU history in his first four starts. Haskins: 47 so far. He passed Barrett’s record of 35 at the end of regulation against Maryland. Haskins: 51. He’s not going to catch Barrett this year, but is alone in 6th place now. Haskins: 352 so far. His average game this season would have ranked 5th all-time in single game passing coming into the year. Haskins: 13 and counting. He broke a tie with Joe Germaine in the Michigan game. Haskins: 9 and counting. He broke a tie with Joe Germaine in the Michigan game. Haskins: 9, he broke a tie with Joe Germaine and J.T. Barrett against Northwestern. Haskins: 51 and counting, 47 passing and 4 rushing. He broke J.T. Barrett’s old record of 47 against Northwestern. DH carried this team on his back, one bad pass, but his scrambles and his accurate passing allowed OSU to win by 21! Just wish, OSU would of opened up this O more in the early to mid stages of the 2nd half! I don’t know if Dwayne heard us but some of the fans were chanting one more year as he was receiving his MVP award.